Pete Seeger was one of my heroes. I remember attending a solo concert of Pete’s at Carnegie Hall when I was a young man. He stood on a small oriental rug on a bare stage, just him, his banjo, his guitar and a full house of people ready to sing with him. At intermission he simply sat down on the edge of the stage, feet dangling, and chatted with people. There was no proscenium, no pretentions, and no separation between performer and audience. I was at the time a professional children’s performer, and I promised myself to be like Pete, as much as I was able. I wanted to bring people together. 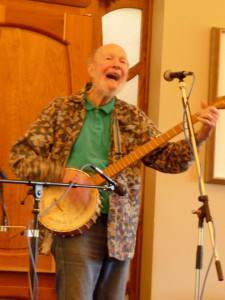 The way I lead today is a conscious and direct result of watching Pete Seeger. I first listened to Pete when I was a baby. My favorite record was “Birds, Beasts, Bugs and Bigger Fishes”, an album of songs about animals – just Pete and his banjo, recorded on Folkways. Since high school I have performed his classic story-song “The Foolish Frog” countless times (from that very album), and it never fails to delight and to get children dancing. In college I wrote Pete a fan letter, describing how we had named our performing troupe “The Corner Store” after the Corner Store in the “The Foolish Frog” in which all of creation gathers for a big party. He wrote me back an encouraging handwritten note on homemade stationery that I remember to this day. 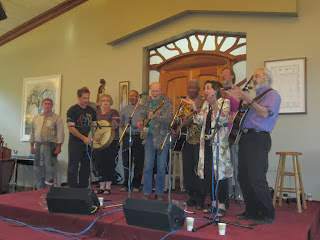 When life brought me to Woodstock and the Hudson Valley, one of the great, added benefits of that move was that I was in Pete Seeger’s home stomping grounds. Time and again I got to see Pete, and thanks to my friends in the folk community on a number of occasions I even got to share the stage with Pete. My early sense of Pete’s integrity was only confirmed and strengthened by my greater proximity to him: he was the same personable, engaged, curious, selfless to a fault, unpretentious man wherever and with whomever he stood. Watch the video of that moment on this Facebook post. Afterwards Pete and his out of town guests needed a bite. Betty Boomer had cooked, and I pulled out a variety of delicious leftovers from our synagogue retreat the day before, and we all sat in one of classrooms and talked and sang and laughed some more. So there I am, some 57 years after hearing my first Pete Seeger record, singing and eating and chatting with the man himself! And he’d been singing and troublemaking long before I was born. It seemed to me sometimes that Pete just might never die. But of course even the longest race finally ends. Toshi Seeger, Pete’s wife of nearly 70 years and truly the woman behind the man, left us this past July, and Pete, it turns out, was not far behind. His grandson reported that Pete had been chopping wood just 10 days ago at his beloved mountaintop home overlooking his Hudson River in Beacon, New York. Pete took ill last week, and the end came swiftly. May we all be so blessed to go like that, still vigorous in old age. Of course I’ve been pretty sad today, even though I knew this day must come. I am one of thousands and thousands that Pete Seeger has not only personally touched, but inspired to live a life of meaningful effort. I am one of countless millions that Pete has inspired and will continue to inspire through his songs. I do charge you not to cry. And you are also mine. Thank you, Pete. I’m still here, and as long as breath is in my body I will keep on singing, encouraged and inspired by the blessed memory of you.